The complete collection of Charlie Chan TV classics. Only 39 episodes were filmed for this 1950s syndicated series. These rare shows are not available from any other source and were transferred for film. 39 Episodes – 6 DVD Set. The famous Oriental detective, employed as a police inspector in Honolulu, ventures across the globe on special assignments, often becoming involved in bafflingly difficult murder investigations. J. Carrol Naish starred as Charlie Chan in this syndicated TV series from the 1950s. These Charlie Chan television shows have been carefully selected from archival films. Many of these films were stored with with inattention for many years. Therefore perfect picture quality cannot be guaranteed. Digitally remastered. 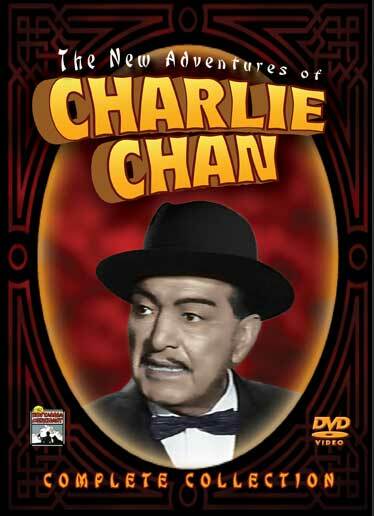 The complete collection of Charlie Chan TV classics. Only 39 episodes were filmed for this 1950s syndicated series. These rare shows are not available from any other source and were transferred for film. 39 Episodes – 10 DVD Set. Your Money or Your Wife, The Secret of the Sea, The Lost Face, Blind Man’s Bluff, The Great Salvos, The Counterfeiters, The Death of the Don, Charlie’s Highland fling, The Patient in Room 21, The Rajput Ruby, The Final Curtain, Death at High Tide, Circle of Fear, Exhibit in Wax, Backfire, Patron of the Arts, Hamlet in Flames, Dateline: Execution, The Sweater, Noble Art of Murder, Three Men on a Raft, No Holiday for Murder, No Future for Fredrick, Safe Deposit, Voodoo Death, The Expatriate, Airport Murder Case, The Hand of Hera Dass, The Chippendale Racket, The Invalid, The Man in the Wall, Something Old, Something New, The Man With a Hundred Faces, Point of No Return, A Bowl by Cellini, Without Fear, Kidnap, Rhyme or Treason, Three for One.